About ten years have elapsed since I first discovered that the Village of Flowers and Herbs was a focal point for the anti-nuclear movement. Actually, I visited the Village of Flowers and Herbs on one previous occasion. Perhaps it was the second or third Tulip Festival. Naturally, I was impressed by the beauty of the tulips, but I remember being even more impressed by the mysterious atmosphere generated by the people gathered there, people whom I had never encountered before. At the time I had no idea that a few years later this place would create a major turning point in my life.I don’t recall precisely when I first met Keiko Kikukawa, but I know that when I became involved in the campaign against Japan’s nuclear fuel cycle the local opponents of the Rokkasho Reprocessing Plant were rapidly giving up the fight, the fire of their once fierce movement almost extinguished. Under those conditions, only a very few people expressed their opposition. Among them was this woman whom I kept coming across. She ran a tulip garden under the slogan “village development that is not dependent on the nuclear fuel cycle” and acted as a bridge between the movement within Aomori Prefecture and the rest of the movement. At first I wondered at the source of the power of this quiet diminutive woman. There is something about the psychological pressure of continuing an opposition campaign in Rokkasho Village which defies description. On top of the ongoing campaign, you have to add the physical strain of running a farm. Frictions within the movement would also get you down, besides countless other stresses and strains. As a consequence, Keiko Kikukawa has been hospitalized on two occasions during these past ten years. Despite all this, she doesn’t complain. She greets everyone with a smile, cooks vegetables from her garden, and each spring her tulips adorn her field in Rokkasho. Her effort and conviction, action and passion were recognized in 2007 when she was awarded the Tajiri Award1 for contributions to the prevention of pollution and environmental damage. 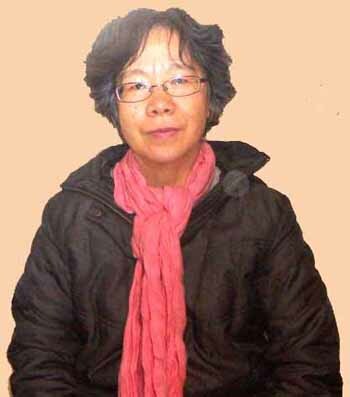 She was the second person from the small village of Rokkasho to win the award, after former Mayor Rikisaburo Terashita. I think that is very significant. Due to the numerous accidents and scandals that have occurred, the Rokkasho Reprocessing Plant will not begin commercial operations in 2010. Keiko Kikukawa now faces many issues, such as the management of the Village of Flowers and Herbs, the continuation of the Tulip Festival and other new projects. The young people from around Japan who have visited her since the film Rokkasho Rapsody (see NIT 130) was released have become aware of the problems in their own back yards. They returned to their own fields of endeavor questioning Japan’s disgraceful policies and administration. For those young people, their encounter with Keiko Kikukawa was both a great eye-opener, as well as a significant event in their lives. So each May let’s gather in Rokkasho. Let’s pay a visit to Keiko and her tulips. 1. The award is given every year by the Muneaki Tajiri Memorial Foundation, which was established in memory of Japanese environmentalist Muneaki Tajiri. *Masakazu Yamauchi is a musician and artist. He is a member of the two man band “zodiac nova, pop-machine & contemporary system”. See his Japanese web site PEACE LAND/YAM.